Kublai on the landing, in the sun. 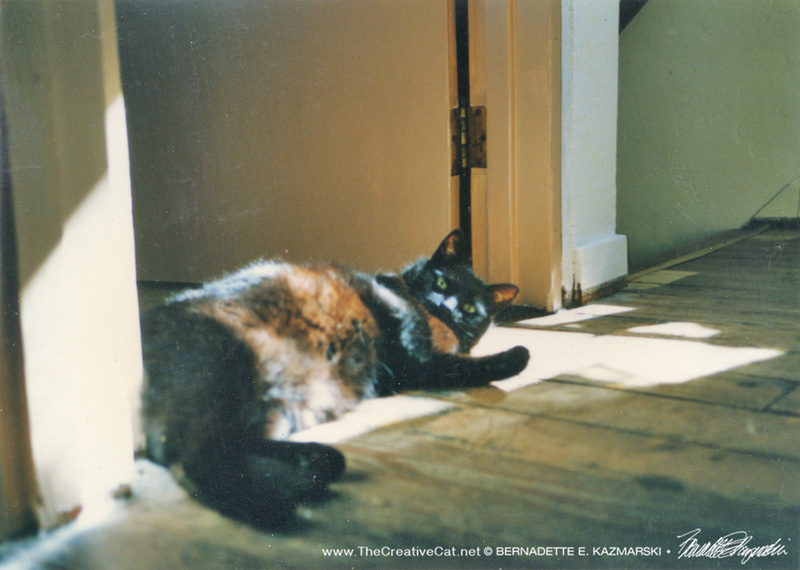 In the studio I turned around to see three black cats lazing about in the sun on the landing, and came around to a memory of another black cat in the sun on that landing, more than 20 years ago. I pulled out the envelope of photos I’d collected of Kublai for his portrait and there he was, once again, his mahogany highlights bright, his fur shining, his silly activities a joy, but his attention often focused on me so that I always remember his face, though it’s hard to see here. I don’t have too many photos of him because he was usually draped around my shoulders or relaxed in my arms, and I was glad to have caught his little performance in the sun on this particular day. He unrolled himself to fill the sunny area and looked full at me. Was I paying attention to what a fine performance he was giving? Of course, I could hardly take my eyes off him. I got up, probably nudged my toes into his belly, and moved around to take more photos from different angles because that is what is next on the roll of film. And those photos became this. Before I had a cat of my own, I loved black cats. Each summer when the neighbors’ cats had kittens, back in the days before regular spay and neuter, I loved the dark tabby swirls and stripes and the creamsicle orange and whites and the shimmering solid grays. But the fuzzy black kittens, the sleek black adults, appealed to a visual style that I still love today—the clear silhouette, the contrast of eyes, no matter the color, in dark fur, the play of light on physical structure, finding the graceful curves of cheekbone and hip as if their highlighted dark fur made them somehow transparent. I had no idea then what was developing in my young aesthetic sensibilities, but it is still with me today as I look at these five, still a surprise to see a highlight gracefully trace the spine to the tail, or see whiskers emerge from the darkness of a muzzle tucked in sleep. And all the colors that shine from black fur in different light…I could go on and on, but you see it nearly every day in my sketches and in the art I present. Detail of face and paws. And long before Mimi and the Fantastic Four, before most of the cats who shared my life, in fact, was the first black cat, the first cat I rescued as an adult. He rescued me while I was in college and became my feline muse even then, before I was even working as an artist, and continued to guide and inspire me, to both art and to rescue—his rescue and the way I came to feel for him was the reason I began rescuing years ago. And even as I began sketching, drawing, painting, and developed my techniques with animal portraiture, he remained an inspiration, but never a model. He died in 1996, but it wasn’t until 2005 that I finally painted his portrait. In part this was because I had so few photos of him, and not for the lack of a camera but because he was always on me somewhere, draped around my neck under my hair, hanging with his paws around my neck and nestled in my elbow, on my lap, on the back of my chair. Even with studying him all the years he was with me, I still needed reference photos to be certain I had the details right. Don’t you just want to dig your fingers in that fur? But he was also a very complex cat, we had been through quite a lot, and for years I simply could not decide what pose would be best to capture him. I could visualize him in so many ways and while I considered the idea of painting a series of portraits of him, I knew I just needed to wait, and it would come to me. And it did one morning when, in my studio, I turned around and saw the winter sun shining brilliantly on the bare wooden floor of the landing and I remembered watching him rolling around there in the way he did, acting silly, often in apology for something he’d done that I didn’t particularly care for like opening the refrigerator and pulling food out. But I knew what I was remembering was a moment when he was acting as feline therapist, because I was having a bad day as I sometimes did, and he knew it and was doing his best to get me past my dark mood, not just with being adorable and irresistible but also with letting the sun play across his fur, pulling all those wonderful mahogany and blue-purple shades from within it, his pale green eyes contrasting with the depth of his face, his velvety paws waving aimlessly, pulling the artist out of the depths to inspiration. After years of living with cats and being aware of how they react to me as I go about my business and work on my art I’m absolutely certain they know what’s going on in my head, and that my whole being changes when I’m feeling the inspiration and something I find is visually inspiring. That’s why so many of the photos of them I publish are in my studio because my cats have always loved to be with me when I’m in that “alpha state of mind”, and I’m convinced that my success of fostering has been in part because these new cats always spent their first weeks with me in my studio. I think animals know us best when we’re in this place beyond verbal communication, and I’m sure they could see the lovely images playing in my head and feel the peace that steals over me as I visualize. So as I looked at the shadows falling crisp in the sun and soft in light reflected off the doors and walls, pulling the details from the old wood boards, each one different, I could see him there and knew that was the moment. Then, his expression, direct, “Are you looking at me?” Not only for attention for himself, but for my own distraction, and my inspiration. It worked every time. All the lights came on for me and I saw this portrait in that moment. I found the few reference photos I had and began immediately. Dark mood? He could still dispel it over ten years later. Detail of “de tail” and wood floor. This painting was done in a variety of different brands of pastels and pastel pencils on Wallis sanded paper. I still have the original, watching over me in my kitchen where I also spend quite a bit of time. Many other people loved him too, all the way from college to the days we lived in this house. More intelligent than many people I’ve met, friends of mine will remember him as the cat who opened the refrigerator door, took out a container, opened it, and helped himself to the contents. Visitors always saw him as bold but friendly, open and outgoing, walking right up to you and looking you in the eye, inviting pets and reaching to be picked up. He goes with me in his portrait to every show that has to do with cats and I love to see total strangers stop and visit his portrait, his magic still alive. 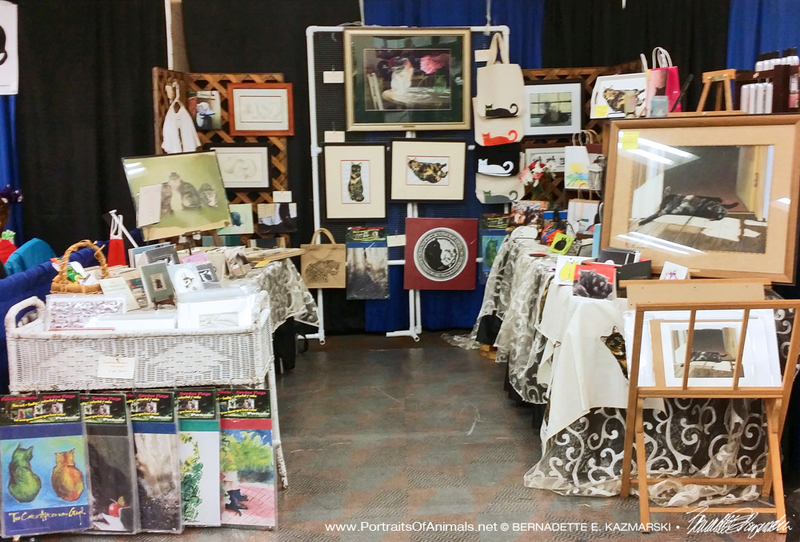 My display at the cat show. The best way I can thank him for his services as feline therapist is to keep sharing him, and keep sharing the gift he gave me, to turn to love in the darkest hours, to rescue others so they might be able to do that as well, and to never forget my own gift of creativity that brings me inner peace and brings joy to those with whom I can share it. Read other stories and essays about Pet Loss as well as my Pet Loss in the First Person series. Also read other articles in The Artist’s Life. This is the guy who started it all–and nearly the last one to have his portrait done! He fostered every stray kitten and cat I ever brought into my home, and shepherded me through the ups and downs of the fifteen years he was with me. Read more and purchase. What a beautiful boy – you captured him perfectly!! Thanks, Chris. That was a lesson in patience, and waiting for the right moment. Always had lessons for me, that boy!